Boericke's Materia Medica proposes an accurate and reliable source of combined materia medica and repertory. The repertory uses Boenninghausen's idea of complete symptom. A section on rare remedies and on tinctures has been added, making the book more comprehensive. One of the great classic materia medicas in homeopathy. Third Revised & Augmented Edition. 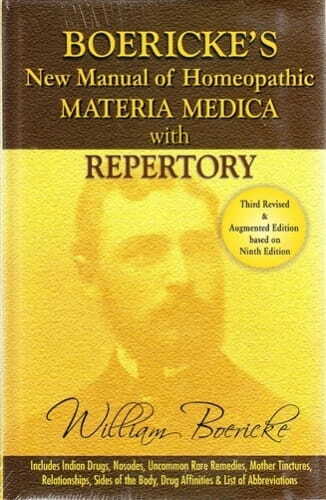 This masterpiece of Materia Medica by Dr. William Boericke, is as accurate and reliable a compilation and the fullest collection of verified facts of materia medica and clinical suggestions. The book contains known and verified characteristic symptoms of all our medicines besides other less important symptoms aiding the selection of the curative remedy. In its present form it contains the maximum number of reliable materia medica facts in the minimum space. The book has been widely appreciated and praised by the homeopathic fraternity for its in-depth analysis, modern terminology, dictionary, footnotes, font, print and presentation. William Boericke was born on October 25, 1849 in Austria. He graduated from the Philadelphia Medical College in 1876 and from Hahnemann Medical College in Philadelphia in 1880. Moving to San Francisco he took over the Boericke and Tafel pharmacy and practiced as a homeopath for over fifty years. He was editor of the California Homoeopath and co-founder of the Pacific Homoeopathic Medical College and Hahnemann Hospital in 1881. He was also a member of faculty of the Hahnemann Medical College in San Francisco. In 1901 he authored Boericke's Materia Medica. On April 1, 1929 he died of a massive heart attack.